The 9679 AT-ST & Endor is a Star Wars set that was released in 2012. 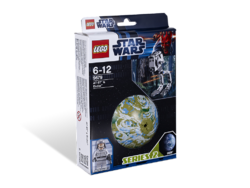 The set features a mini-model AT-ST, an AT-ST Pilot minifigure and Endor moon pieces. This is a description taken from Hamleys. Please do not modify it. In Star Wars: Episode VI Return of the Jedi, the forest moon of Endor, which houses the second Death Star's shield generator, comes under attack from a Rebel assault team. Aided by the indigenous Ewoks, they ove rpower the Imperial AT-STs and destroy the shield generator. This set includes an accurate model of Endor, an AT-ST driver minifigure, an AT-ST mini-model, a weapon, and a display stand with name plaque. Collect the other Series 2 sets: 9677 X-wing Starfighter & Yavin 4 and 9678 Twin-pod Cloud Car & Bespin! 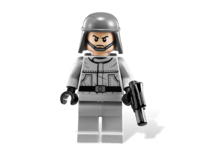 The AT-ST pilot's redesigned head was also used for the 2012 redesigns of the Rebel Trooper and the Death Star Trooper. Facts about "9679 AT-ST & Endor"
In Star Wars: Episode VI Return of the Jedi, the forest moon of Endor, which houses the second Death Star's shield generator, comes under attack from a Rebel assault team. Aided by the indigenous Ewoks, they ove rpower the Imperial AT-STs and destroy the shield generator. This set includes an accurate model of Endor, an AT-ST driver minifigure, an AT-ST mini-model, a weapon, and a display stand with name plaque. Collect the other Series 2 sets: 9677 X-wing Starfighter & Yavin 4 and 9678 Twin-pod Cloud Car & Bespin! This page was last edited on 11 August 2016, at 14:53.